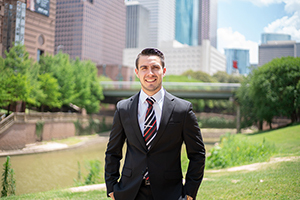 University of Houston Law Center alumnus Jorge Zamora '18. June 12, 2018 — Last but not least, 2018 University of Houston Law Center graduate Jorge Zamora eagerly awaited his turn to cross the stage as 236 of his classmates were announced during the commencement ceremony May 11 at NRG Arena. "Because of my last name, I've usually been the last one called to most receptions or rewards that I received," Zamora said. "It's something that I have gotten used to in my 20-something years of being in the education system." When his name was finally called, Zamora's main focus was not the crowd's ovation, but to make sure he "didn't do something silly across the stage." "The people who went there for me specifically ended up telling me that the crowd did cheer a bit louder," Zamora said. "It was an incredible feeling to be hooded by my favorite professor, Assistant Dean Greg Vetter. When I was a 2L, I had him for patent law. He was a mentor who helped me through my job placement struggles." Throughout his childhood, Zamora had ambitions to attend medical school. "As a senior in high school, I ended up having to do a blood analysis and fainted at the sight of my own blood," he said. "At that moment, I knew that I could not go into medical school. My counselors suggested going to law school since I was in debate, so I thought I'd try it out." Zamora said transitioning from a background in biological sciences to studying patent prosecution at the Law Center proved to be difficult. "I faced an uphill battle, however, Assistant Dean Vetter walked me though everything and was just an amazing mentor," he said. "I'm from El Paso, so I knew that I wanted to stay in Texas. When I looked at the rankings of who has good intellectual property programs, the Law Center was at the top. It was close to my family, and the in-state tuition was a very big incentive as well." "It's crazy now that I think about it. I got into law school, took courses, liked the subject matter and now I'm hired by a firm that exclusively does intellectual property." Zamora currently clerks at Rao DeBoer Osterrieder, PLLC, and strives to one day become a judge. 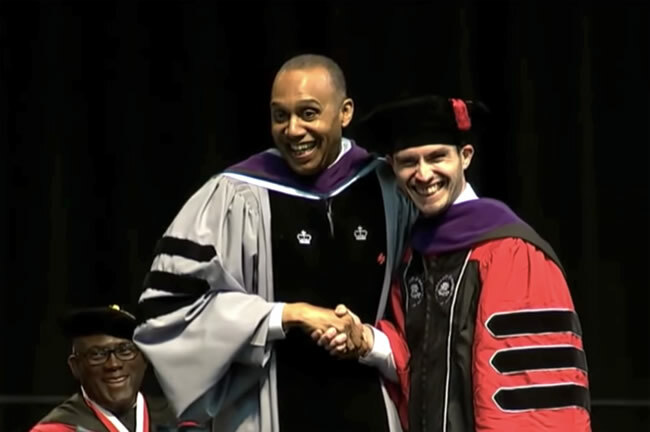 University of Houston Law Center Dean Leonard M. Baynes, left, and Jorge Zamora '18, right, during May's commencement ceremony.